this past weekend in Dayton, Ohio. The drum corps activity was well represented at the WGI World Championships in Dayton, Ohio this past weekend as the Santa Clara Vanguard Winter Guard completed an undefeated season to win its first World Championship title. The Vanguard won the Independent World division with a score of 97.100, besting its fellow California competitor Corona Winter Guard by more than a point. This is the fourth year Santa Clara Vanguard has fielded a winter guard under its current incarnation, and the unit has been an Independent World finalist all four years. Except for two members, everyone in the ensemble has previously been a member of the Vanguard program, either as a color guard member or in the drum corps. A third of this year's winter guard members will be marching as members of the 2009 drum corps. Denise Bonfiglio, director of Santa Clara Vanguard's winter and summer guards, says the corps started to see a benefit last summer from the corps' winter guard program that has helped to create a nucleus of strongly trained members. "The winter guard allows us to keep teaching kids straight out of the drum corps season," Bonfiglio said. "Then, in the spring, we're not retraining members from scratch in our techniques. They already know what is expected and they know the style." Jeff Fiedler, CEO of the Santa Clara Vanguard organization, also says that the winter guard is beneficial for the organization and keeps the corps' name in the lights. "It's also a reward for the kids who graduated from the corps and still want to stay involved." As an added bonus for the corps, according to Fiedler, every member except one is from California and most are from the Bay Area. The Vanguard's 2009 program was titled "The Kiss." Themed on the trials and tribulations of relationships, each member expressed a different part of the story through his/her performance. "What is unique to the Vanguard program," according to Bonfiglio, "is that we didn't generate effects through tosses, which is what the activity is used to seeing. We played through the story line, and the moments of the members' physical contact were used for effect. The equipment and bodies were very much intertwined; the equipment became an extension of the body movement." to WGI competition this year to take ninth place. Other drum corps affiliated groups were well represented throughout the WGI Championship weekend. Crown Guard, a part of the Carolina Crown organization, was also a finalist in the Independent World Class, finishing ninth place with a score of 87.000. The Academy Winter Guard finished in 24th place in the Independent World prelims with a score of 77.300. The Blue Knights affiliated Opus 10 color guard took the silver medal in the Independent Open division with a score of 92.800. "There are few people who ever get the opportunity to compete for a World Championship and in spite of the intense pressure involved; Opus 10 had the show of a lifetime today," said director Rob Billings in a post on the Blue Knights' Web site. 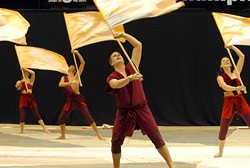 Billings served as the Blue Knights' color guard caption head and designer during the 2008 Drum Corps International season. Revolution Independent (affiliated with the DCI Open Class corps Revolution), and Beatrix, (2008 DCI International Class Champion from Hilversum, the Netherlands) also competed in the WGI Independent Open division. Learn more about the WGI World Championships at WGI.org.